Over the past several decades, polarization across the American political system, at the local, state, and national levels, has accelerated. There are various causes for this schism, one of which is gerrymandering. Gerrymandering – the drawing of a voting district in such a way as to favor one group over another or others – is nearly as old as the Republic itself. Article 1, section 2 of the United States Constitution established the basis for representative democracy, including a directly-elected House of Representatives, to which adult citizens could elect someone to represent their collective will in the national government. The Constitution provided for a decennial census to ensure that all residents were equally represented. To emphasize the federalist nature of the United States, the Constitution entrusted to the states the responsibility to rebalance the apportioned number of seats, based on population, within that state. This system seemed fair and equitable, especially since the framers believed that factions – or parties – would not develop. Various safeguards to protect and extend civil and voting rights were added by the 14thth (1868), 24thth (1964) and 26thth (1971) Amendments, and the Voting Rights Act of 1965. Since then, gerrymandering has been a part of the American political system. Over the past several years, additional attention has been directed to the pernicious effects of gerrymandering. When given the chance, Democrats and Republicans have proven to be equal opportunity offenders. Interestingly, our political leaders have felt powerless to overcome gerrymandering’s temptations. In an amicus curiae brief to the US Supreme Court in the case of Gill v. Whitfield (which the Court sent back to the lower courts for re-review in June 2018), a bipartisan group of 34 current and former members of the US Congress collectively recognized that gerrymandering is a systemic tool used to silence an opposing party and that, in its modernized form using computer modeling down to the voter household, gerrymandering has accelerated. The specificity of modern gerrymandering has legitimized polarization and discouraged cooperation, since seats are ‘safe’ from being contested by the other party. Only someone from within one’s party typically challenges an incumbent, which lessens the need for compromise or diplomacy, at home or abroad. While gerrymandering has been considered a domestic problem, it is also a critical issue for foreign policy. There are at least four, interrelated issues. First, our electoral system is a representation of our democratic principles . Over the centuries, America’s representative democracy has often inspired oppressed peoples to seek representation and redress social ills. What has taken hundreds of years to acquire dearly –our moral leadership as a democratic society, where all are created equal and have an equal voice in government – is being squandered cheaply. And, perhaps gerrymandering at home has inspired foreign agents to interfere with our local elections since we appear to hold them in such low esteem. A second, inter-related theme is that decreased fidelity to democratic principles by our national leaders emboldens leaders elsewhere to circumscribe rights with impunity. Several recent examples – of Duterte in the Philippines, Erdogan in Turkey, and newly elected president of Brazil, Jair Bolsonaro – should give us pause domestically. A third effect is that political polarization vitiates the impulse, at the level of the US government, to support foreign aid that is not tied to a tangible, immediate return for America. In other words, domestic gerrymandering distorts the values we place on relationships with other countries into purely transactional ones. And, these transactions tend to be economic and Hobbesian in nature. To take but one, current example: the American executive branch’s unqualified support for Saudi Arabia in spite of egregious violations of international laws and norms in Yemen and Turkey. Since our legislative branch is shaped by gerrymandering, it has taken a supine attitude with respect to the executive branch’s bankrupt approach to the Saudis, which, simply put, places a higher value on oil and the Saudis’ opposition to Iran than the suffering of the Yemeni population: – naked and bankrupt principles of economic self-interest and ‘the enemy of my enemy is my friend.’ But, with friends like the Saudis, whose repressive regime grants few rights to women and nearly none to minorities (religious or otherwise), the increasingly distorted American legislative system means that we have few legitimate levers at home or abroad. Unilateralism domestically and abroad is fostered by our gerrymandered system, because the checks and balances so carefully constructed by the Founders are being gutted. Finally, because the largest issues facing the world are long-term and global in nature – climate change; public and private corruption; food and water security; mass migration from rural to urban centers; and rising inequality, among others – gerrymandering fractures the principles that underlie political collaboration. This means that the US, one of the largest, most important engines of economic growth, income distribution, and technological innovation over the past century, lacks the collective domestic will to tackle even short-term problems. When our leaders proclaim that American interests come first, few beyond our shores will follow us when we say collaboration, partnership, shared burdens are needed. Gerrymandering at home exacerbates the global tragedy of the commons. Domestic American gerrymandering threatens the international order itself. While self-interested leaders in state capitals across the US see small victories in towns and counties in middle America, these victories aren’t worth the cost. The unintentional consequences of gerrymandering inflict gratuitous wounds that threaten to destroy American claims to foreign policy leadership. Gerrymandering may rank as one the greatest abdications of leadership in world history. [i] Barasch, Emily, 2012. “The Twisted History of Gerrymandering in American Politics”, The Atlantic, https://www.theatlantic.com/politics/archive/2012/09/the-twisted-history-of-gerrymandering-in-american-politics/262369. Previous: Previous post: We built the WTO to advantage us. Why don’t we use it? 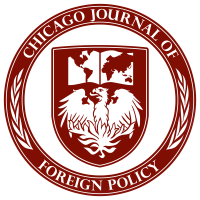 Next: Next post: CJFP’s Winter 2019 Edition!